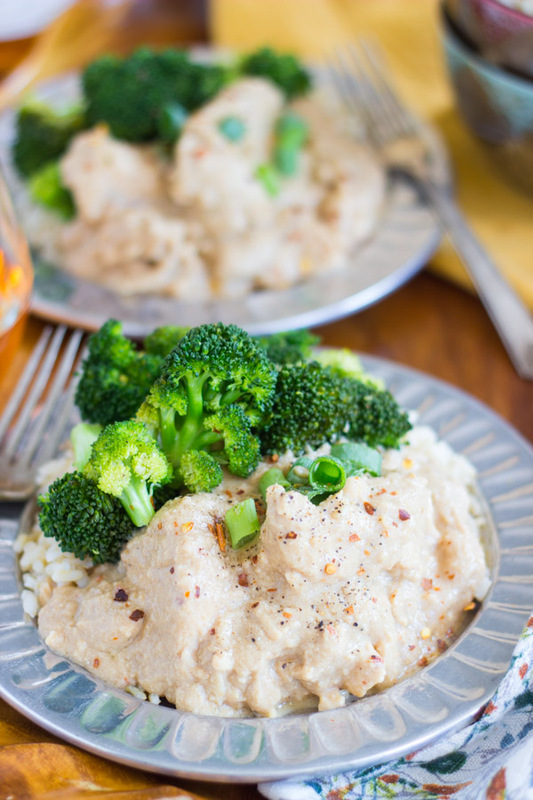 Prepped in minutes, this Slow-Cooker Thai Peanut Chicken is as good as takeout! 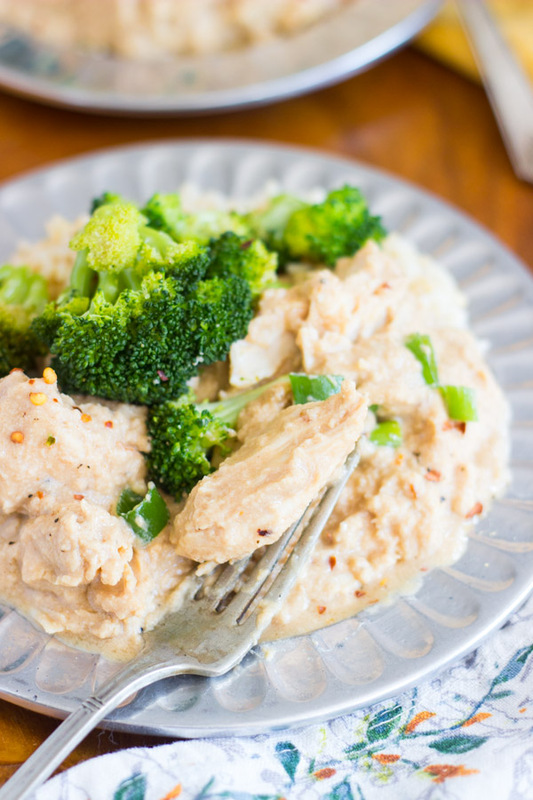 Serve it with rice or broccoli for an easy weeknight meal! This might surprise you, or it might not, but I even love peanut butter when it’s in something savory. I don’t always need it in something sweet or in a dessert. I even love it savory. It took me a long time to discover this though. I was out at a restaurant with friends a few years ago, and somebody ordered Chicken Satay with Spicy Peanut Sauce as an appetizer. That was my first experience with peanut sauce on chicken, and I was sold immediately. I was skeptical to try it, but once I did, it won me over fast. If I’m out at a restaurant, and the menu offers chicken skewers with peanut sauce as an appetizer, I usually order them. I tell myself that it’s also a smart nutritional choice because it’s healthy fats + protein. Ha! 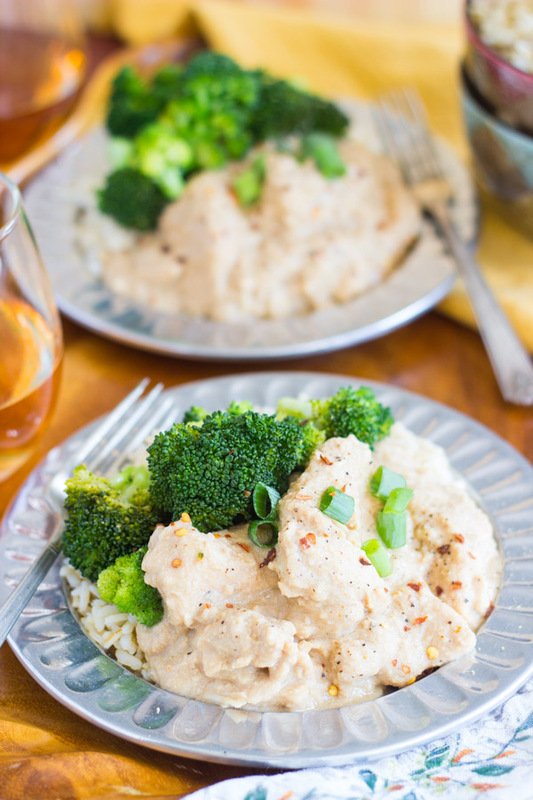 But I also like to make peanut sauce at home, as long as it’s in the slow-cooker. It is my favorite kitchen appliance, by far! Except for my coffee maker, actually. I love that I can just throw everything in the slow-cooker, turn it on, and come back a few hours later to a completely cooked meal. 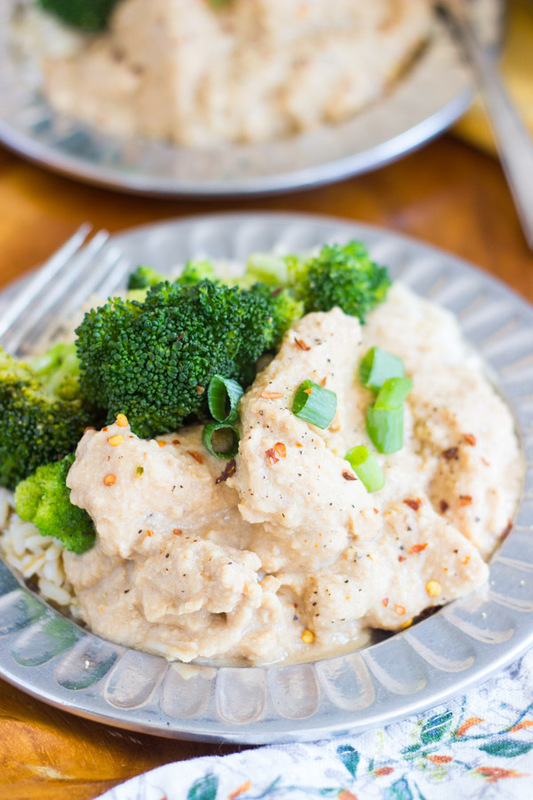 This Slow-Cooker Thai Peanut Chicken is all I’ve been wanting to eat lately. I’ve discovered that people have different preferences for their peanut sauce though. 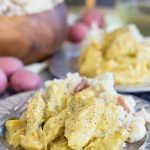 I like this recipe exactly as it’s written, but my S.O. likes his peanut sauce to be more peanut-buttery. If that’s the case, just give it a taste when it’s done, and it’s easy to adjust. Just whisk extra peanut butter into the slow cooker, to taste, toward the end of cooking. For me, the key ingredients to this sauce are the red pepper and sesame oil. I love the spicy kick that the red pepper adds, and the sesame oil is critical. 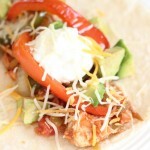 It adds smokiness, nuttiness, and just an all-around depth to the sauce. The sesame oil is so potent for being such a small amount, and it has an intense, roasted essence. I love it. 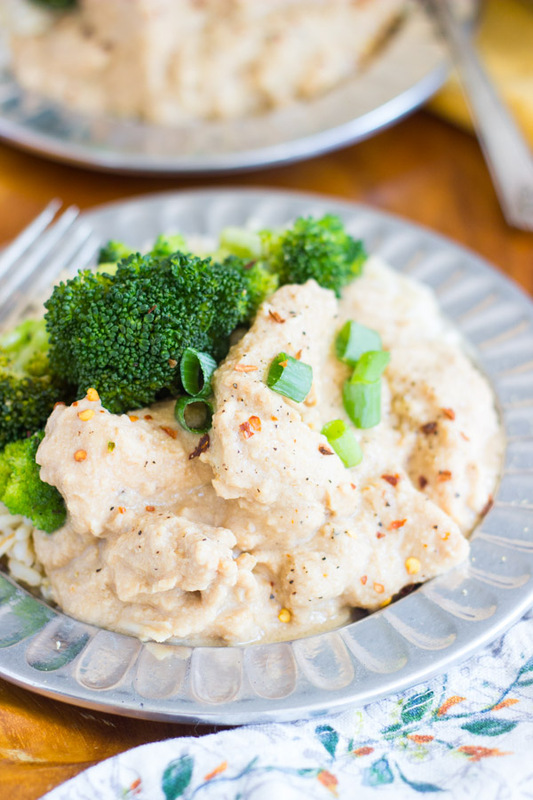 This Slow-Cooker Thai Peanut Chicken recipe couldn’t be easier, and you can never have enough slow-cooker dinner recipes on hand. Give it a try, and let me know what you think! 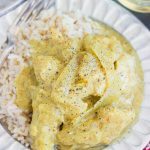 Aside from this recipe, I also suggest this Slow-Cooker Coconut Curry Chicken (my fave! 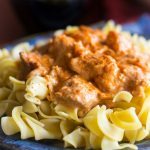 ), Slow-Cooker Chicken Paprikash (it’s soooo popular on the blog), and this Slow-Cooker Honey Mustard Chicken. Yum! I love just about any Thai dish, but kids are far less willing to try it. Being able to make it at home sounds perfect. Thanks for the recipe! Try a slow cooked tomato vegetable soup (chicken broth, diced tomatoes, tomato sauce or crushed tomatoes, onions celery, green peppers, garlic, zucchini and/or summer squash, s&p, Italian seasoning, and blend in 1/3-1/2 cup peanut butter as the end….it’s one of my favorites! 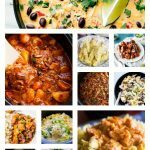 It’s an African inspired use of peanuts or ground nuts, and there are other recipes online for many variations as soups and stews. Many also include yams or sweet potatoes. Peanut Butter is also good in chicken soups, especially Ramen! I learned that from friends who had a Chinese restaurant, and served staff with peanuts in chicken noodle soup, too. It’s very good!